This simulation is intended to help stdents understand some of the phenomena involved during the formation of rainbows. The circle represents a single spherical raindrop. The black line represents a single ray of light from the sun. When a light ray strikes any air/water boundary, both reflection and refraction occur. 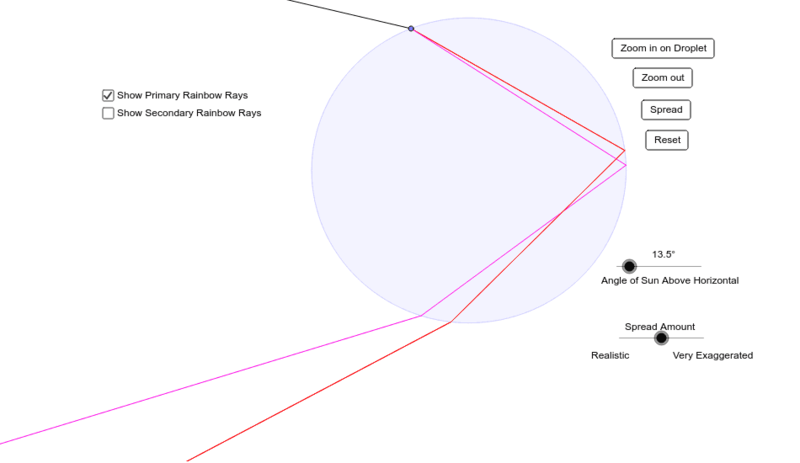 In this simulation only the rays important in the formation of rainbows are shown. The reflected and refracted rays that do not contribute to the rainbow formation are not shown. A ray of light from the sun enters the drop and is refracted. Because the index of refraction of water is slightly higher for the violet end of the visible light spectrum, a violet ray will refract, or bend, a little more than a ray from the red end of the spectrum. This effect is known as dispersion. The rays partially reflect off of the back surface of the raindrop and refract again when exiting near the bottom of the drop. The actual spreading of the colors is small (about two degrees). In this simulation the spread angle can be exaggerated in order to better see the individual reflections and refractions. When the "Spread Amount" slider is all the way to the left the refelction and refraction angles are realistic. Red and violet rays, representing either end of the visible spectrum, are shown. Press the "Spread" button to see a representation of the entire visible spectrum. Clicking the checkbox marked "Show Secondary Rainbow Rays" will show the rays that form the secondary rainbow in a double rainbow. These ray have one extra reflection as compared to the rays that form the primary rainbow.